lifeasdaddy: lifeasdaddy - Ko'Olina Lagoons. 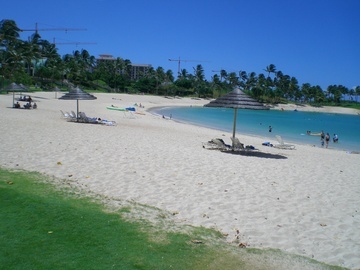 The best beach for children on Oahu, Hawaii. lifeasdaddy - Ko'Olina Lagoons. 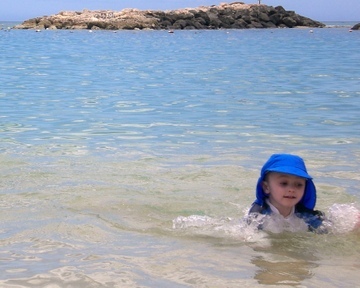 The best beach for children on Oahu, Hawaii. I won't go into much detail about those beaches we found inappropriate for kids this week, I'll just tell you the best we found. This is for children under 5 years with limited or no swimming ability. I add this caveat: I believe that children need to be supervised constantly, continuously, and 100% of the time while in the water. This level of supervision includes the beach I am about to name. The Ko'Olina Lagoons are a set of 4 man-made (woman made?) seawater lagoons which are protected from waves by rock breakwaters. The beach is made of fine sand and is gently graded. Here's a pic of Edward practising his swimming. The lagoons are surrounded on the land side by a master planned development comprising the Marriott Ihilani Resort & Spa, a timeshare condominium development and the Ko'Olina Marina. As such it is a gated community and when approached by road a security guard at the shack will ask your reasons for visiting. Each of the lagoons has a small amount of free public car parking - around 20 spaces each - which were full each time we visited. Apparently the public car parking fills by around 9am each morning. When the public car parking fills, the guard turns away beach goers. The trick is to tell the guard that you are going to eat at the Resort restaurants, and also visit the beach. The guard will issue a lagoon pass. At Lagoon #1, the first on the right hand side as you drive in, there are reasonably clean amenities blocks, and open air beach side showers wash off the salt water. There is also foot access to the Marriott resort where you will arrive at the Poolside Grill. We had lunch at this casual dining outlet twice and both times were very pleased with the food, beverages, and especially the service. (Thanks Ryann) Here's the menu, and you can see that the prices are higher than McDonald's, but quite reasonable for this type of hotel and environment. Importantly, parking in the hotel/resort car park is free with a spend of more than $25 in the resort's food & beverage outlets, so if you park in that car park (probably your only choice) then be sure to take your car park entry ticket with you and have it validated by your server upon payment. Contrary to what may be read elsewhere on the Internet, there are no lifeguards on duty. See this Google Map for a satellite view of the lagoons which appear as crescent shapes. You can zoom out on the map to see driving directions, and it's position relative to the rest of Oahu island. It's about 25 or 30 minutes drive from Waikiki. The kids loved having a swim amongst the gentle waves and building sand castles on the sand. The lagoon was so great and terrific... Pretty nice place to visit and spend the holidays to Ko'Olina Lagoons, Hawaii... Nice information..
Nice lagoon. And it's nice that the kids can swim in the beach without parents having to worry so much for their safety because of the water current. lifeasdaddy on Denis Cox designed a rocket in 1957. He has just received a response. Ryangfrazer on Denis Cox designed a rocket in 1957. He has just received a response. Lucy Longines on lifeasdaddy - A good watchmaker in Sydney is hard to find. Lindsay Mann on Do you know what a Forest Devil is? Clearing trees on rural land in the 1800s. Joyce Varcin on Do you know what a Forest Devil is? Clearing trees on rural land in the 1800s. Frances Windolf on Joseph Cox as a younger man. Rod Roberts on There are no atheists in foxholes: A World War Two soldier's Bible. phil on 1st Lt. Jared Landaker's final flight.